Part One of a series looking at inter-city games involving Philadelphia area teams and St. Louis teams in the 1910s. Soccer in the United States at the start of the 1910s was undergoing a rise in organization and popularity. That organization was largely locally based and varied in both scope and effectiveness. One exception was the American Cup tournament, the first edition of which had been organized by the American Football Association in 1885. Despite its name, however, the AFA was effectively regional in both authority and participation, covering territory along the Atlantic coast as far north as New England, through New York City and the Hudson Valley, and as far south as Philadelphia. While encompassing a region that collectively was the main hotbed of the game in country at the time, no team from further west than Philadelphia had participated in the American Cup tournament, and its claim to deciding the national champion rang hollow in the soccer hotbed of the West, St. Louis. Civic pride demanded champion teams of one city should compete against the champions of another. And if some of those teams also happened to be winners of the American Cup, claims of inter-city supremacy might grow to claims of national supremacy. And so, a series of short tours that saw East Coast teams travel to St. Louis, and vice versa, followed. A number of factors combined to make these long distance tours possible. A national telegraph system allowed for easier organization of such tours and also supplied daily newspapers with timely match coverage. A well established national rail system allowed for affordable long distance travel. The economy was growing strong following the economic crises that had ushered in the turn of the new century. The establishment of stable local leagues in major cities was accompanied by the re-emergence of the American Cup competition after a six-year hiatus between 1899 and 1905. This in turn would be a part of the momentum that would lead to the eventual formation in of a truly national soccer governing body that began with the founding of the United States Football Association, now known as the United States Soccer Federation and National Challenge Cup in 1913. Another factor was as obvious as it was simple: Soccer’s popularity was rising. Therefore, organizers could offer guarantees to traveling teams to cover expenses thanks to gate receipts from high profile games. These early tours would prove that a truly national tournament to determine the champion of the United States was possible. 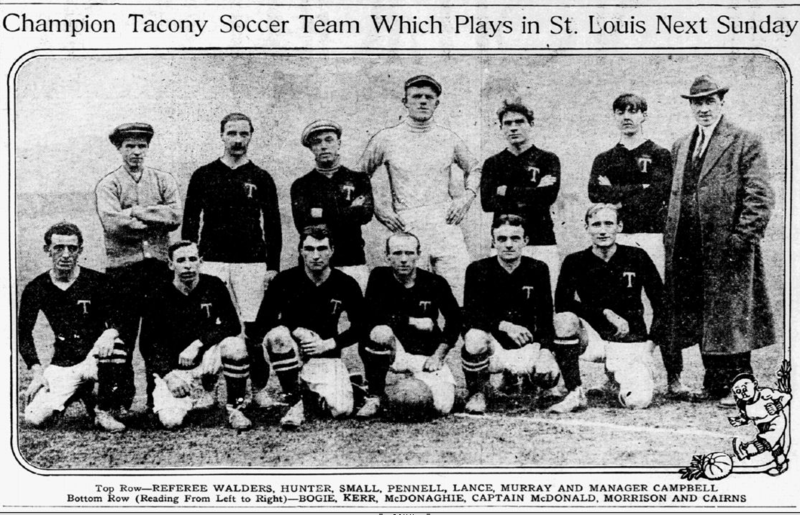 The first East Coast team to accept the challenge to travel to St. Louis would be Tacony FC, members of Philadelphia’s professional Pennsylvania League, winners the American Cup tournament in 1910, and a semifinalist in the 1911 tournament. Philadelphia teams had faced opponents from other cities since at least 1891 in exhibition matches that were billed as inter-city championships. (Before that, Philadelphia North End had traveled to Trenton, New Jersey to face Trenton Rovers on January 9, 1889 for what turned out to be a punishing 9-0 loss). These games were often short series with home and away legs taking place over the Thanksgiving, Christmas and New Year’s holidays against opponents that were typically from the Newark area of Northern New Jersey or New York City. Leading Philadelphia teams were also keen to test themselves against visiting squads from England such as The Pilgrims and Corinthians, as well as American teams that had gained national prominence by winning the American Cup and, later, the National Challenge Cup, known today as the US Open Cup. Not only were these matches an opportunity to measure the quality of Philadelphia clubs against top-class opposition, they were an occasion for proud Philadelphia soccer fans and boosters to promote the game locally, as well as a chance for clubs to make some money to fund their own participation in national tournaments. In addition to Philadelphia teams entering the American Cup competition, Philadelphia Hibernian and Philadelphia Thistle had recently participated in the short-lived Eastern Soccer League. Comprised of prominent teams from New England, northern New Jersey and Philadelphia, the league was the brain child of the AFA’s Robert Morrison with Thistle’s president, Andrew M. Brown, acting as vice president. The planned format of the league was to play home and away series on Sundays and on holidays. But bad weather and scheduling problem’s—Pennsylvania’s blue laws prohibited the playing of games on Sundays, for example—meant that half of the scheduled games did not take place and the league folded after the 1910 season. The St. Leo’s team was one of the earliest professional soccer organizations in the US. Led by coach, organizer, and promoter Billy Klosterman, the “blue and whites” won ten St. Louis championships between 1903 and 1915. By guaranteeing his players a portion of the gate receipts, Klosterman was able to build his team by signing the best players he could find, whether they came from other St. Louis teams or from as far afield as Chicago. Before the founding of the National Challenge Cup tournament that soon superseded it, the AFA’s American Cup was the only tournament that had any kind of official claim to naming a national champion. But, as David Lange writes in Soccer Made in St. Louis, because the tournament participants came from the northeast of the US, “St. 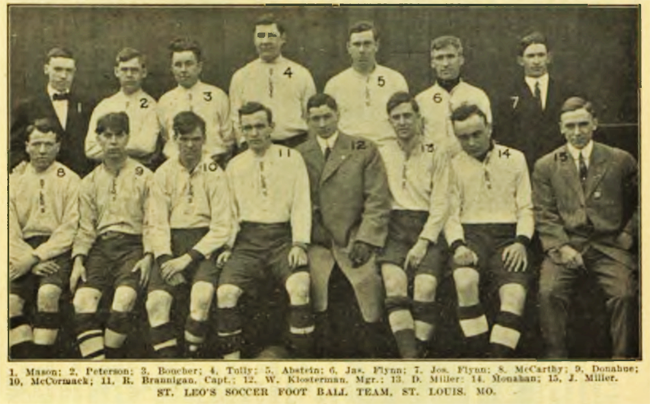 Louisans refused to recognize the American Cup winner as the national champion.” In order for a national champion to be named, St. Louis soccer boosters believed East Coast teams ought to travel there to play the best team that city had to offer. Led by manager Aleck Campbell, the team was built on the skill of immigrant English and Scottish players such as forward Hector McDonald, “easily the best all around player in the country,” and center halfback Rob Morrison, “without a peer in this country,” and a former Junior International from Scotland. In contrast, St. Leos players were native-born Americans. This contrast would for years continue to be a recurring theme in contests between St. Louis teams and East Coast teams. The Inquirer reported on December 22 that an additional game had been added to the St. Louis series to be played on Christmas Day, the day after the meeting with St. Leos. 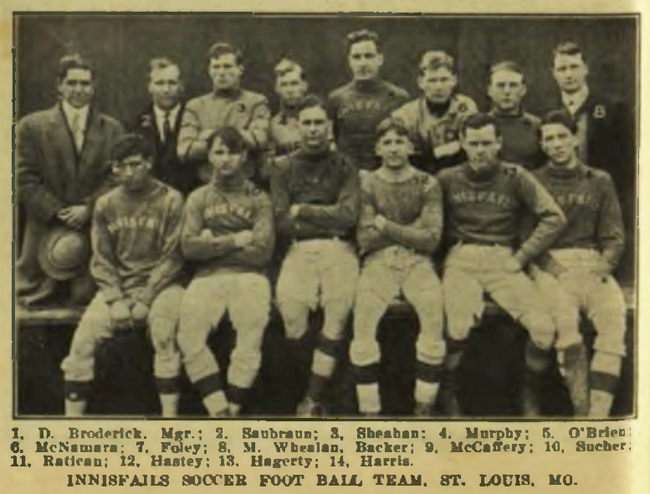 The opponent would be Innisfails, who were second in the St. Louis League behind St. Leos and soon to supplant them as the dominant team in St. Louis soccer. While the Inquirer reported that “Several clubs have tried to induce Tacony to stop off on their homeward bound journey and show their worth,” the work obligations of the team’s players prevented the addition of further matches. Indeed, the squad of twelve players that left North Philadelphia Depot for St. Louis on December 22 was not the regular Tacony team. Five Tacony starters who had been instrumental in helping “to place their team in the foremost ranks of the soccer world” had been unable to secure leave from work and were replaced by players from other Philadelphia teams including Philadelphia Thistle and Philadelphia Celtic. Among those players was former Scottish international Tommy Hyslop. While the Tacony players may have been “professionals” in that, like their counterparts in St. Louis, they shared a portion of the gate receipts from games, these earnings were not enough to make a living. They all had day jobs to support themselves and their families. St Leos in 1911. From the Spalding Official Soccer Football Guide 1911. On a heavy, muddy field dotted with pools of water, St. Leos opened the scoring only three minutes after the start of the game off a goal from inside left forward William Monahan. Twenty minutes later, center forward “Bull” Brannigan made it 2–0. Two minutes before the half, J. Taylor scored again to make it 3–3. Then Tacony and St. Leo piled up on each other in a scrimmage exhibition such as seen only once in a generation. The St. Leo forwards rushed the ball into Tacony’s goal area, but were halted less than a yard from the goal by an almost impassable wall of wily little backs. Shins, toes, and the ball shared equal honors in the exchange of kicks. Then someone slipped in the mud and nineteen players involuntarily formed themselves into a heap of humanity, with the small leather ball the center of attraction. Those looking for the declaration of a Champion of America would have to content themselves with a draw. Innisfails in 1911. From the Spalding Official Soccer Football Guide 1911. The Inquirer match report for the draw against St. Leos described, “In addition to being a struggle of the East against the West, the game was a contest of old-world tactics against those of the new. Tacony, defending the good name of the East, was composed entirely of foreign-born players coached into the methods their forefathers used in England and Scotland.” Against Innisfails only a day after that epic battle, Tacony would face a rested team again composed of native-born players. Inside right forward Bingham scored first for Innisfails after 16 minutes of speedy play characterized by both teams rushing the ball from one goal area to the other. Tacony soon equalized from an own goal when Innisfails defender Pete Harris “missed his kick and the sphere rolled safely through the uprights.” Immediately after the resulting kickoff, Innisfails again worked the ball into Tacony’s area and outside right Murphy scored to make it 2–1. Five minutes before the half, Innisfails center forward McCaffrey scored the final goal of the game to make it 3–1. The Inquirer reported on December 26, “The Tacony players put up an excellent exhibition so far as individual work was concerned, but when it came to well-oiled soccer machinery the local squad had a combination that took their opponents off their feet.” Tired from the previous day’s game, and fielding a team half of which was composed of players from other teams, the Philadelphia club simply did not have it in them to make another comeback. Upon their return to Philadelphia, manager Campbell blamed muddy conditions, hard luck and goalkeeper Archie Pennell. The Inquirer reported on December 28, “Pennell was unable to do himself justice, allowing the easiest shots imaginable to roll into the net,” adding, “Had Pennell shown any of the form that he has previously displayed in this city, Campbell believes that they would have lowered the colors of their rivals in both games.” Pennell was out of Tacony’s lineup when the team lost 1-0 in Pennsylvania League play on December 30. On January 30, 1912, the Saint Louis Post-Dispatch reported Pennell had been fired. Filled with confidence when they left for St. Louis, Tacony returned to Philadelphia without bragging rights to being Champions of America and filled with excuses. Despite a thrilling comeback against St. Leos, a lackluster showing against Innisfails had resulted in their fourth loss in two years. East had met West and come up wanting. Whatever the causes of their disappointing showing, Tacony would soon have another chance to lower the colors of St. Leos, this time in Philadelphia. The St. Louis team would be touring the East in March, 1912. A version of this article first appeared at the Philly Soccer Page on February 15, 2012. For more on Tacony goalkeeper Arthur Pennell, and the story of the recent return of his 1911-1912 Pennsylvania League Championship medal to Philadelphia, see A champion’s medal comes home.